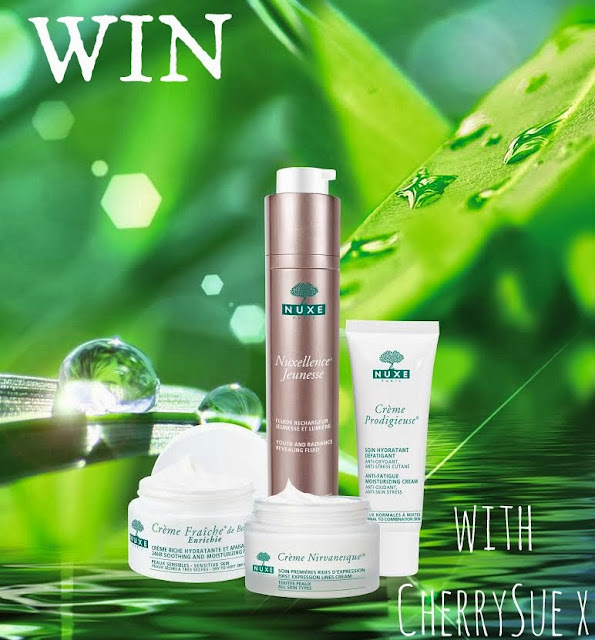 CherrySue, Doin' the Do: Win a Luxury Nuxe Collection Worth Over €100!! Is your daily facial routine in need of an overhaul? Then today's competition is one for you. We have an incredible luxury Nuxe collection that includes their number one selling product (and one of my top 3 favourites) Nuxellence Jeunesse not only that but it's bolstered by an arsenal of anti-ageing, soothing creams. Valued at over €100 this high end line up will ensure the New Year sees a new you and getting your name in the running to win the lot couldn't be easier. Because of the size of the prize, this Giveaway is restricted to the Republic of Ireland but don't fret international lovelies, there's another prize drop coming this afternoon! Winner will be announced on December 24th. Wow all these prizes are great! Happy Xmas! Have never tried any Nuxe products so I'd love to win this! This would be my first NAKED palette :) I would be very happy! Loving the new look, lady. This would be my 1st naked pallette. My friend loves this product so i would love to try it. Would love to win this Luxury Nuxe Collection! Talk about spoiling us rotten! !